This Jump Start Power Pack is a low cost rechargeable emergency power option that can be easily adapted to power amateur radio operation in the field. Conveniently rechargeable from 110 volt commercial power or a solar panel with regulator, the addition of Anderson PowerPole connectors enables the power pack to provide the voltage and current required by amateur radio transmitters in the 100 watt range. 2. The Jumpstart's 12 volt sealed lead acid battery is rated at 17 Ah. 3. Initially, I wired a pair of Anderson PowerPole connectors to a cigarette lighter plug for use as light duty emergency power pack for the amateur radio station. This was sufficient only for radios that draw two amperes or less. 4. 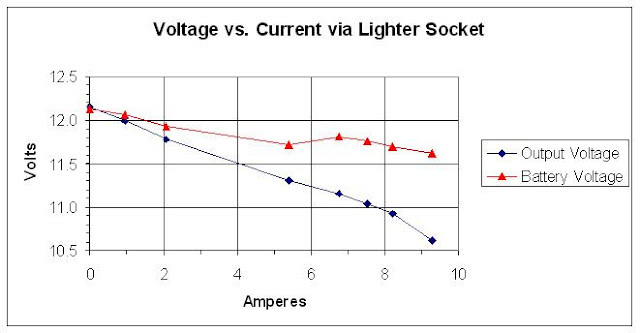 The measured voltage at the cigarette lighter socket decreased proportionally to the current drawn. Below 11.1 volts, the radio's frequency display went dark and the cigarette lighter plug and socket became hot. The calculated internal resistance was 0.05 ohms for the battery and 0.1 ohms for the internal wiring, the cigarette lighter socket and plug. 5. Anderson PowerPole connectors were installed to permit operation of radio equipment that requires more current. To wire PowerPole contacts in tandem, cut and solder a tinned 12AWG solid wire into a U shape with 5/16" spacing and 13/16" length. 6. A length of 12AWG stranded wire is soldered to the center of each U. 7. The PowerPole contacts are fully inserted into their housings. 8. The assembled PowerPole connectors slide into the 1470G1 chassis mount and are secured with a 110G9 retaining roll pin. 9. After disconnecting and removing the battery, the holes for the chassis mounts are drawn--each one 2.2 cm by 3 cm. Two chassis mounts are required to provide power connections for the radio, an amplifier and an antenna tuning unit. 10. The chassis mount holes are cut with a Dremel tool cutting wheel. 11. The PowerPole connectors in their chassis mounts are snapped into place. 12. The other end of each 12AWG stranded wire was soldered to a ring terminal for attachment to its respective battery terminal. 13. I soldered another pair of Anderson PowerPole connectors onto a properly fused DC power cable for my HF transceiver. 14. After installing the Anderson PowerPole connectors on the power pack, the transmitter produced the full rated 100 watts RF output. The fully charged power pack delivered 15.74 A at 11.74 V through the Anderson PowerPole connectors with 11.8 V at the battery terminals. The radio's display showed no dimming or instability. 15. 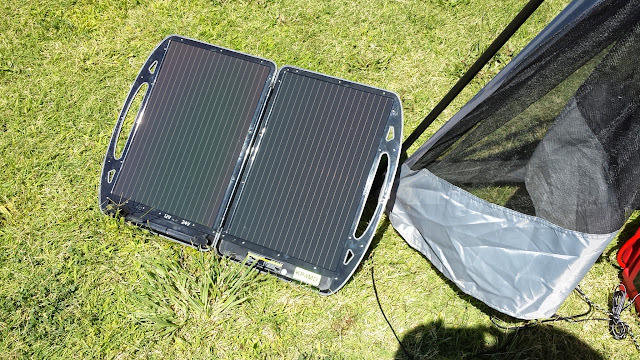 This 13 watt briefcase solar charger with a solar charge regulator maintains the 17 Ah battery sufficiently charged for low power station operation through daylight and night hours.